The festively decorated stalls, the unique atmosphere with a delicious scent of mulled wine and the atmospheric lights in the charming medieval city of Nördlingen will enchant you and definitely put you in the Christmas mood. 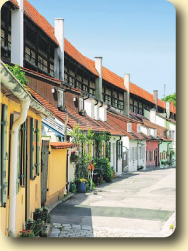 There are more than 60 stalls and booths to explore in Nördlingen's old quarter. 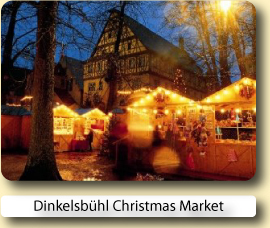 With its delicious delicacies, tantalizing aroma of mulled wine and special arts and crafts the Christmas market in Nördlingen, on the Romantic Road, is one of the most beautiful in the Bavarian part of Swabia. A varied program of concerts accompanied by special Advent city tours awaits our visitors. 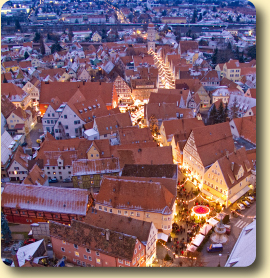 And why not combine the visit of the "Romantic Christmas Market" with a tour of the unique, medieval Old Town of Nördlingen? Take a stroll around the completely walkable city wall or visit the watchman on the 90 meter high tower "Daniel". 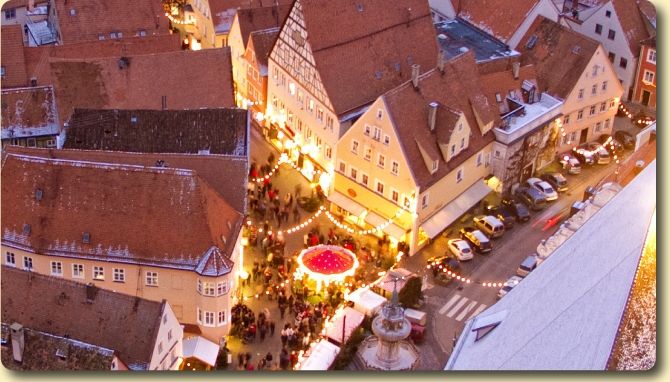 Let yourself be carried away by Nördlingen in the Christmas season! 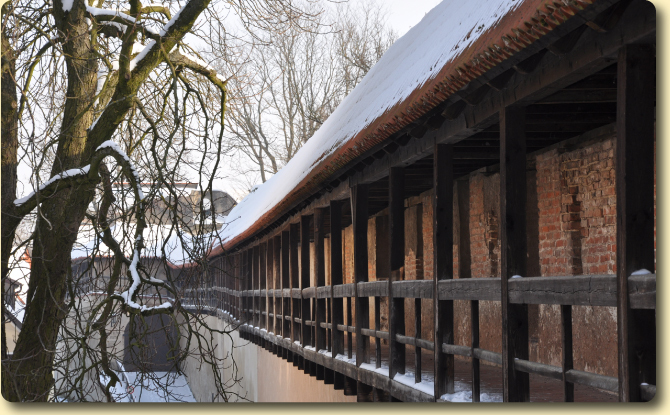 Nördlingen is one of the most impressive towns on the central part of the Romantic Road. Together with Rothenburg and Dinkelsbühl, located just a few kilometres to the north, Nördlingen shares its name as being one of the only remaining walled medieval towns in Germany. Nördlingen, however, is far less crowded than the other two neighbours and offers an additional geological attraction, a giant meteorite crater. Most of Nördlingen's medieval walls and impressive towers have been built from the rocks formed by the meteorite impact. Germany's most famous and popular tourist route, the Romantic Road, runs for 350 kilometres across a rich and varied cultural landscape along the river Main and through the Franconian wine country to the Alps. This fantastic route between Würzburg and Füssen offers visitors the opportunity to see small historic towns with very impressive buildings and places of historical interest that have lost nothing of their original charm. Around Nördlingen the route leads through the charming Tauber Valley and the Nördlinger Ries, perfect for cycling tours or in the winter, cross-country skiing. The rooms were very large with a sofa and plenty of wardrobe space. The bathroom was also huge and spotlessly clean. The hotel was great value for money situated in the centre of town. Buy a one day German Rail Länder Ticket and you could explore all the Christmas Markets in the state of Bavaria for one amazing price of: One passenger: €23 Extra person: €5 Unlimited travel, one price, through out Bavaria (see map above) for up to 5 people, 9 a.m. until 3 a.m. of the following day and on Saturday, Sunday and bank holidays from 0a.m. until 3 a.m. Valid on all local trains (Interregio-Express, Regional-Express, Regionalbahn, S-Bahn). Prices quoted are for 2017 ticket machine purchases only. 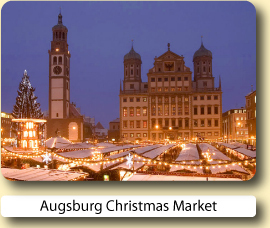 Book your hotel for the Noerdlingen Christmas Market with Expedia or Hotels.com.Both online reservation services will let you compare and book hotels at great low prices.